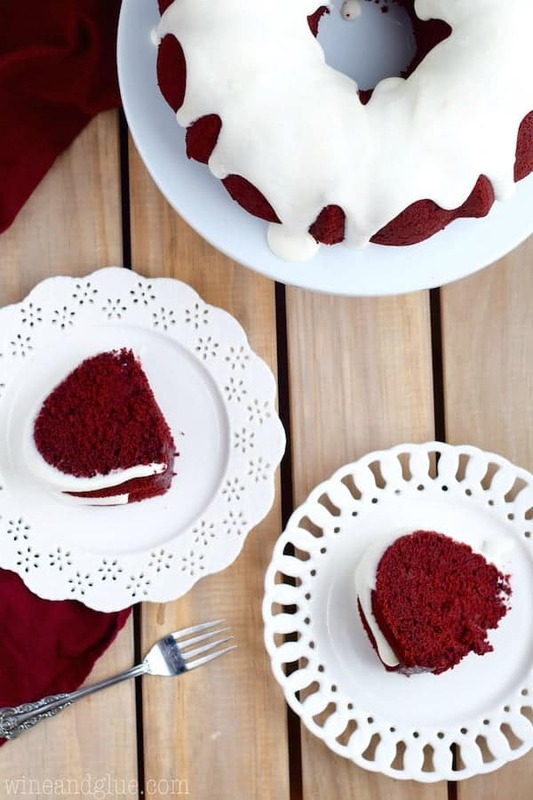 This Red Velvet Sour Cream Bundt Cake with Cream Cheese Buttermilk Frosting is moist, rich, and packed with them most amazing flavor. Thank you Horizon for partnering with me to make this most PERFECT red velvet dessert! And seriously, I couldn’t blame them. You know why taking down Christmas decorations is so depressing? Because it just reminds you that all that stands between you and the next enjoyable time of year (summer!) is the long stretching endless winter. Life in the midwest is hard, peeps. So the best thing to do? Embrace the next holiday! When I was little, my mom didn’t really decorate for any holiday but Christmas, so this decorating for Valentine’s Day thing feels weird to me, but when I said to my kids, “It’s okay that we are putting the stockings away! I have a heart banner!” all suddenly seemed right in the world. The other thing we’re doing? Valentine’s Day baking! 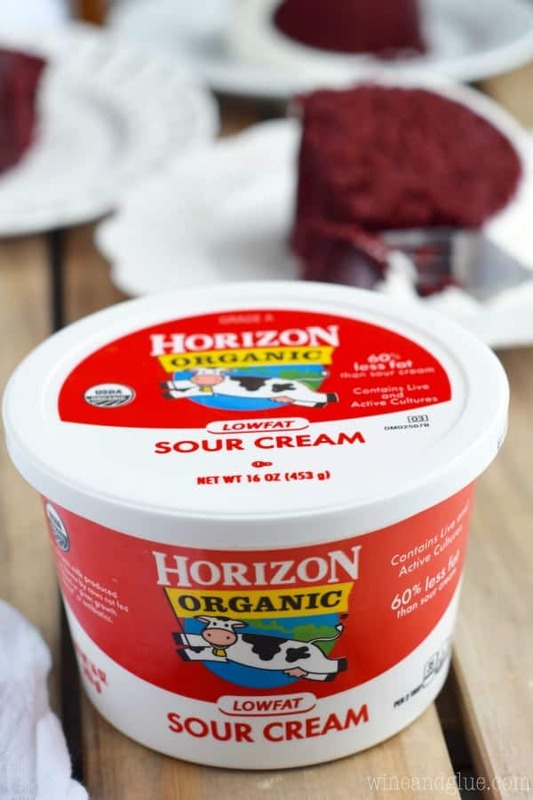 And to do some amazing Valentine’s Day baking I grabbed some Horizon Sour Cream. You guys already know how much I love Horizon. We are slightly addicted to their Mac N Cheese, and we love their milk too! And their sour cream is totally perfect in this cake! It makes it so amazingly moist! Fact: It’s absolutely impossible to have the winter blues while eating this cake. This is the first cake recipe that I’ve ever developed on my own without adapting from somewhere (HOORAY!). I’ve tested it twice, so I feel really good about it. (Four cakes in four days people.) You guys, it’s SO yummy! One of the reasons it came out so well is because after the first go of it I paged through Jocelyn’s book and after looking at several of her recipes, made some key changes. I decided to use cake flour, use less baking soda, and add two egg yolks. You guys, Jocelyn is a wizard. It totally worked! Read the whole recipe and all of the instructions before you start. You need to know what’s on tap people. You really do need to use cake flour. There are tons of places online where you can learn how to make your own, but really that’s what you need. The ratio of the other ingredients are based on the use of cake flour. Make sure to measure your cocoa powder and your flour by scooping them into the measuring cup and then leveling off. Do not cook directly from the containers with the measuring cups, the twill result in too much of both. When I say that the butter needs to be room temperature, you want to press your finger in and make a dent but not have it go all the way through. You can make this happen faster by cutting it up, putting it on a plate, and leaving it on the counter for a half hour. The sour cream, buttermilk, and eggs really do need to be room temperature. If they aren’t, they will make the butter get all chunked up when you add them. You can put the eggs in luke warm water to make it go faster. You can also put the sour cream and butter milk once in their measuring cups in bowls of warm water. Make sure the butter and sugar are well combined. You really need to beat them well so the sugar adds air to the butter. Grease the pan more than you think you need to. You don’t want it to stick. When you take the cake out, you need to let it cool long enough so it sets (15 minutes) but not completely or it won’t come out of the pan. 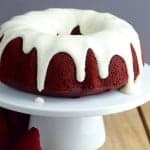 his Red Velvet Sour Cream Bundt Cake with Cream Cheese Buttermilk Frosting is moist, rich, and packed with them most amazing flavor. Preheat your oven to 350 degrees and coat a bundt pan very generously with butter. In a large bowl, whisk together the cake flour, baking soda, salt, and cocoa powder. Set aside. Beat together the sugar and butter until light and fluffy, about three minutes. Make sure that you scrape the bowl down so all of the butter gets well combined with the sugar. Beat in the eggs one at a time. Then add the yolks one at a time. Beat in the sour cream, scrape down the sides, then beat in the buttermilk. Then beat in the vinegar, vanilla, and food coloring one at a time. With the mixer on low, slowly add the flour/cocoa mixture. Beat until just combined. Do not overmix. Pour the batter into the prepared bundt pan . Bake for 55 minutes or until a toothpick comes out with clean. Be careful not to overbake. Let it cool in it's pan for 15 minutes. Use a toothpick to loosen it gently from the sides. Gently flip it onto a cooling rack and let it cool there completely. While the cake is cooling, beat together the cream cheese, powdered sugar, and buttermilk. Once the cake has cooled, spoon the frosting over it. You may not use all of the frosting. Thank you for all the helpful tips! I never feel like cake mixes come out well. We NEVER used them growing up (except for Angel Food Cake) but my husband buys them now, and I am always disappointed. I am a totally from-scratch girl. when it comes to cakes! Still I have trouble finding cake recipes that actually turn out to my liking. These tips will surely help! Plus, adding sour cream ALWAYS makes things better! Totally gorgeous! I want a big slice of this so badly! Lisa!!! This is the prettiest cake EVER. I’m in love. OMG, this cake looks amazing!!! I appreciate all of your tips…I’ve learned quite a few things about what I’ve done wrong with baking from you! Awww, thank you Rachel! I just love you. 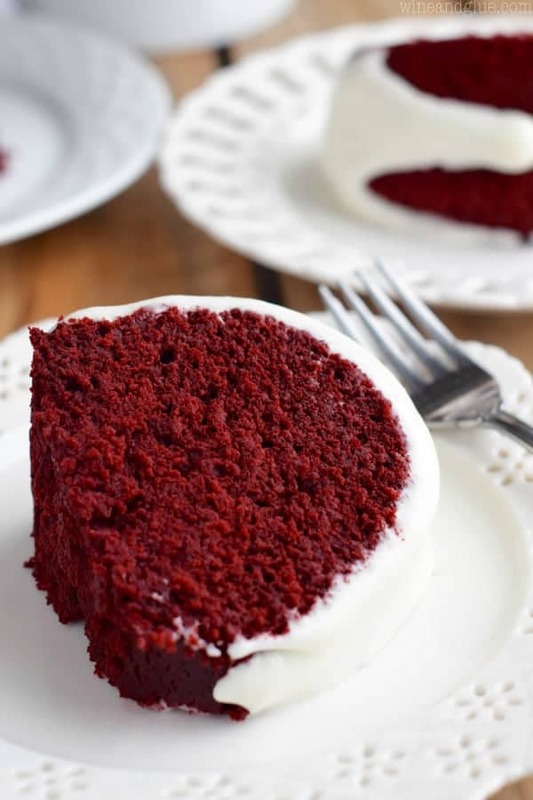 Red Velvet is my absolute favorite! I bet the sour cream makes it so moist, I am pinning this for Valentine’s day! Wow, that cake crumb texture is perfection! I am so making this asap. I love using beets for the coloring of red velvet, and have not used sour cream though, so I’ll try it! I only have salted butter, will it make a big difference? I can’t say for sure how big of a difference it will make, Linda. The affect will be on the taste. By using unsalted butter you can control how much of a salt taste the cake has by adding salt. I just made this cake, Taking it to the Bishop Storehouse tomorrow for the LDS Mixssionatys. I was a about 2 Tablespoons shy of sour cream so I used 2 Tablespoons of Ricotta cheese. I also used salted butter but cut back a little on the salt. Thanks for the receipe I like to take something each Tuesday to the storehouse were I serve as a LDS Missionary, never a drop left. I will print off this receipe to take with me. From a 67 year old legally blind man who loves to bake. Michael, this comment made my day. I hope everyone liked the cake! The cake looks so perfect!!! May I ask if i can use the batter for cupcakes? If yes what is the time for baking? Thank you very much!!! Hi Gie! So, I think that this would be really dense for cupcakes. 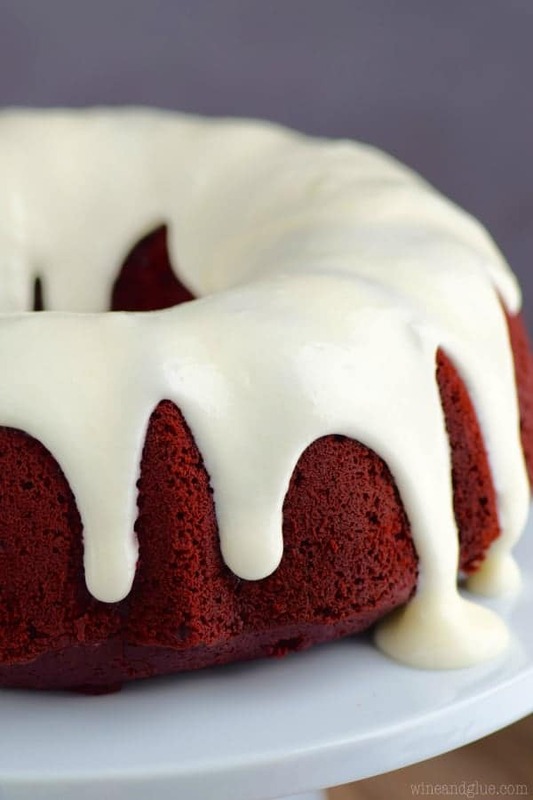 Bundt cakes tend to have a different texture than cupcakes. Cupcakes are light and fluffy and the bundt cakes are thick. Both delicious, but very different. Sorry! This looks wonderful! It seems like a lot of cocoa compared to other red velvet cake recipes I have looked at (most are a tablespoon or two). Is it really a cup of cocoa? Thanks! It really is! I hope you enjoy! I made this cake for my daughter’s birthday celebration today and followed the recipe exactly. I even had the sour cream, eggs, buttermilk, and butter at room temperature. The cake turned out like a heavy pound cake with a super fine, dense crumb. Disappointing. I wonder if I should have cut back on the sour cream or butter milk, or used regular flour. Perhaps there was too much liquid. Would not make this recipe again. Melanie, I’m so sorry you didn’t like it. Maybe just a taste preference? I made mine a few times and it turned out great every time. It was for sure dense but very moist and delicious. Worst cake ever! Very dry. I’m really sorry you didn’t like it Annette. I’m wondering if this was an issue of oven temperature and the cake over baking. Not all ovens are calibrated correctly. I have made this cake several times and it is super moist every time. I’ve been looking for a version like this. I wanted the more pound cake-like texture. Years ago my neighbor made a Red Velvet bundt cake with Cranberry Orange relish in the center and frosted with whipped cream. I’m going to try your cake recipe and go in a trip down memory lane. Making for Christmas, using green food coloring in frosting. I think it will make it festive. Then adding fun Christmas sprinkles. That’s a great idea Tina! Hi Deb. I’m really sorry that you had that experience. I’ve made this cake several times, and it always has that deep red color you see in the pictures. I’m glad you liked the taste! Hello, I am going to try this recipe for my husband’s Holiday party this week. Would it make much of a difference if I used whole milk rather than buttermilk? It really would, Jennifer. The buttermilk is what gives it the red velvet taste. You can make buttermilk at home though! Just take one cup whole milk, remove one TBSP and add in one TBSP lemon juice or white vinegar. Allow it to sit for five minutes and you are good to go! The cake flour I bought doesn’t have baking powder or salt. Is that ok? Hi Kelly! I’m not sure I totally understand your question, but if it says cake flour on the box, and you follow the rest of the ingredients as listed, I think it should be fine. I usually don’t leave comments, but after reading through the other comments, I felt like I should say something. 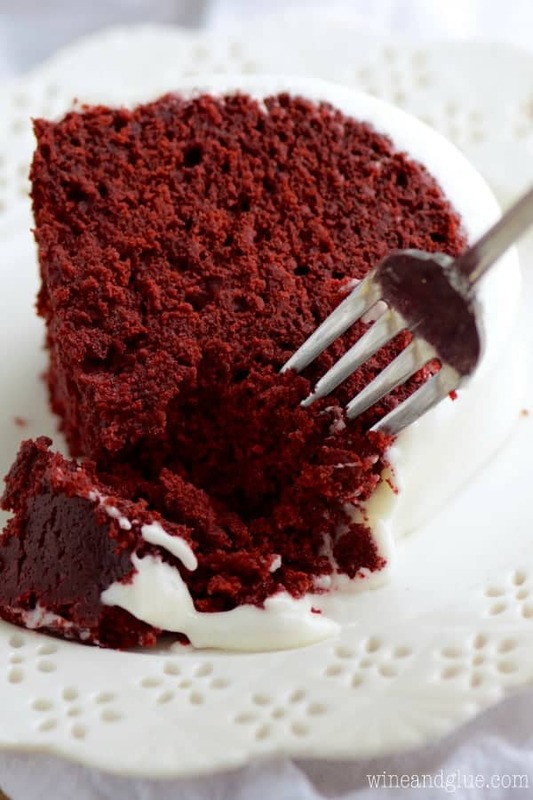 This is one of the best red velvet cake recipes I’ve ever used! And I’m from the South, so I know my red velvet. I thought the amount of cocoa was perfect, and the sour cream made the cake super moist. I got the rich, chocolatey taste, and the color. My grandmother even loved it! She said it wasn’t as good as hers (which is probably the highest bar on the face of the earth! ), but it was certainly a close second. Bravo to you! Kendra? Can we be best friends? The comments are my least favorite part about blogging . . . until I come across one like yours. I *loved* this cake, and have been so frustrated that others haven’t enjoyed it, so reading this absolutely made my day. Thank you!!! Hi, this looks like an amazing recipe! I do have a question…do you think this would make a good cake for carving? My daughter wants a red velvet for her B-day next weekend and I plan to make a Pusheen cake for her so not a lot of carving. This sounds amazing! Perfect for Valentine’s Day! Omg this looks sooo yummy! Can’t wait to make!!! I’ve done red velvet cupcakes and wasn’t satisfied with the red…What red did you use for this?! It’s looks gorgeous ??????? ?❤ thanks for sharing!!! I bought a small bottle of McCormick’s red food coloring, Jennifer. I hope you like it! I’m usually don’t leave comments, but like Kendra, I feel it is necessary this time. I just pulled this out of the oven and chipped a small piece off the top to taste and it is UNREAL. It is so rich and smooth and just out of this world lovely. I used the exact right ingredients (including specific cake flour) and took the time to make sure everything was at room temp. Maybe that’s the difference? I don’t know, but I am excited and proud to serve this at a dinner party tonight! Thank you for this! Yum! Thank you SO MUCH Danielle! I can’t tell you how much your kind comment meant to me! I would like to make this for a friend’s 50th birthday. Do you think it would be okay to make it a day ahead and put in refrigerator? I definitely think you can make it a day ahead, but don’t put it in the fridge. Just wait until the day of to make the frosting. Hi Dee, I would think that it could, but I haven’t tried. The baking time would certainly be different. If you do give it a go, let me know how it turns out! I’ve made this cake once, loved it, however the colour turn out to be very brownie like. I’d definitely make it again, but Isn’t it too much cocoa? I’m glad you loved the cake Emilia! I don’t think it’s too much cocoa, but if you want to make an alteration, I would up the red food coloring. That won’t affect the recipe, but less cocoa powder will. Is the frosting runny or will it set and say on the top of the cake. I am thinking of adapting the frosting recipe to use on a cinnamon roll cake. I want those lovely drips down the side without it being so runny that the slides right off and pools at the bottom. It drips and then holds if memory serves correctly. I think it should work for what you are looking for. 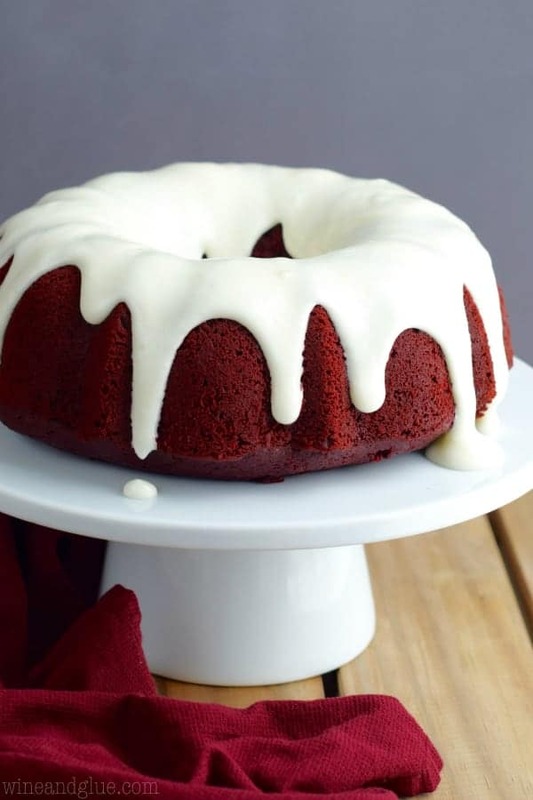 Is it possible to cut back on the sugar in the red velvet bundt cake? I haven’t tried altering the recipe to cut back on the sugar or use a substitute, Julie. If you do, let me know how it goes!